Overpopulation is a well known problem in society. Feral cat populations generally fend for themselves and only through assistance of volunteers do these animals receive any medical care. Participation in this type of work will not only improve practical skills but will very rewarding for our students. The funds will go to improvement of infrastructure i.e. a designated surgery space / treatment area in Boulden building which will allow us to increase the volume of surgeries performed during our surgery/ treatment days of our feral trap spay/neuter release. It will also help us offset the cost of hospital supplies required to perform feral cat surgery. The current budget of our animal providers limits the number of surgeries we are able to perform on the feral cats. The hopes is that this fund will dramatically increase the number of cat’s we can spay/neuter and provide necessary routine preventative health care for cats that otherwise would not benefit from basic medical care. We aim to improve the health of our feral cat population and impact the pet overpopulation problem. The team has established partnerships with several non-profit animal welfare organizations in the region, Colchester Municipality and local businesses. The animal rescue organizations have been carefully chosen, and will be the ones bringing the feral cats in to the students and volunteers. The rescue partners will be determining which cats qualify for this program. There are many different factors that are taken into consideration when looking for cats that qualify. One of the biggest components they look at is urgency. “A colony of 100 cats probably needs to be addressed first versus an area with a couple of cats due to the overall impact on the population i.e. trying to prevent or control a population explosion,” Dr. Lois Parsons explains. 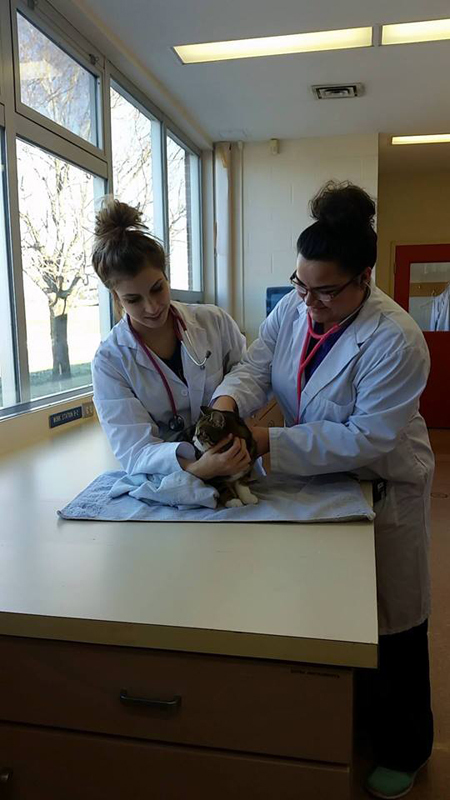 300 Felines is a student run, volunteer based project working to help the feral cat population in the Cumberland Colchester region. Lindsay Russell and Taylor Jacobs are Co-Leads of the 300 feline project and two of the countless volunteers dedicating their time to help these furry felines. “The 300 Felines team is grateful to all who contributed to the success of our crowd-funding campaign; you have given the gift of feline healthcare because you too, recognize that every cat matters. Each cat who is spayed/neutered and provided with veterinary care is one more life improved.” In total, 300 Felines whose goal of $10,000 exceeded it with the final tally at $14,022. With the long weekend coming we'd like to remind our supporters of our account at Subway Bottle Exchange, 25 Pictour Road, Truro NS!